On New Years Eve I lost my heart, my angel, my cheerleader, my biggest fan and my best friend. I was raised by my granny and I am the woman I am today because of her. 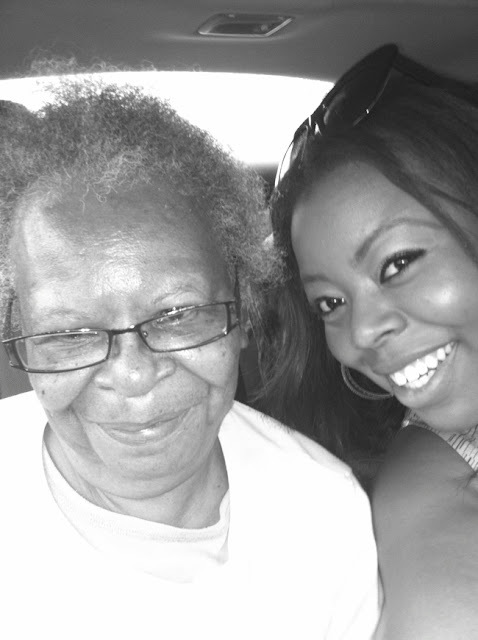 My granny was my superwoman and I miss her terribly. I will be taking a minute from blogging to get my shyt together, cause right now I.AM.LOST. You're in my thoughts and prayers. Sorry for your loss. I am so sorry to hear about your loss Naja. You and your family are in my prayers. I am sorry sorry for your loss. My grandma raised me as well, she passed away four years ago and I still miss her so much. I pray you and your family stay strong through these trying times. So sorry for your lost my prayers are with you! im so sorry for your loss =( prayers. I'm so sorry for your loss. You're in my prayers. Keep your head up! I'm praying for you and your family during this trying time. May you find comfort in knowing she is a rest. I am so sorry Naja...:( I pray that God be your strength and guidance during this though times. Naja, I'm so sorry for your loss. Although you will miss her deeply, take comfort in knowing that she is resting in HIM. God bless you. You and your family are in my prayers. May the peace of God be with you right now. Give Him glory and He WILL give you peace. Sorry for your lost. You will be in my prayers. So sorry for your loss :( Prayers for you & your family. I am so sorry for your loss. Definitely keeping you in my prayers. You have certainly made your Granny proud and just know that she's smiling down on you. Sory for your loss, paying for you. I'm a silent follower of your blog, but wanted to tell you how sorry I am for your loss. In reading our blog, I' m impressed with how beautiful a woman out are, inside and out. That's a testament to the beautiful woman who raised you. Stay strong & know there are many people keeping you in their thoughts & prayers. I dont usually comment but my heart goes out to you. Hold fast to the memories! I'm so sorry to hear that Naja. May it comfort you to know that she is now restign in perfect peace. My prayers are with you and your family. Very sorry for your loss...its times like this that I remember Sermon on the Mount from the gospel of Matthew, "Blessed are those who mourn, for they shall be comforted..."
Sorry for your loss! I had come by the blog to see where you might be and I had no idea. God bless you and your family! So sorry for your loss Naja. May God guide you during this difficult time. I am sorry for your loss, God bless you and your family. She is such a better place. God bless you.